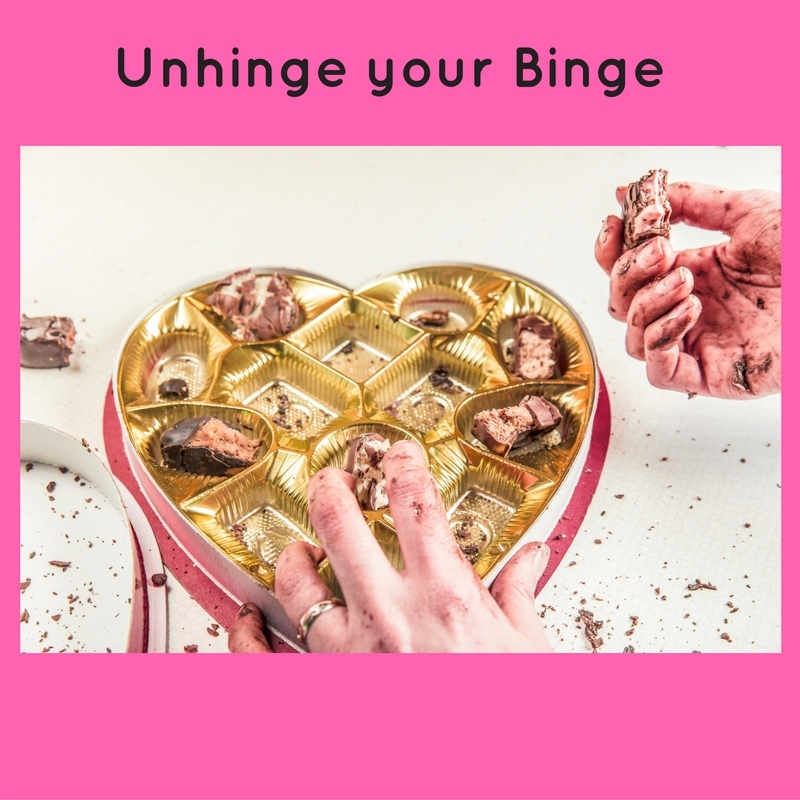 Binge is a term Americans use a lot with respect to food and drink and even with watching the latest streaming Netflicks series. But I want to delve into and focus just on the topic of binge-eating in this article. Just say the words “Binge Eating” aloud right now and many of you will cringe. Why? Because it’s a term loaded with guilt, with shame and even with disgust even to those who have never binged in their lives. Bingeing has extremely negative connotations and is oft-linked to people who are overweight, slovenly, and lazy – this is simply not true. Now, I’m not saying that people who binge don’t also happen to possess some or all of these characteristics as well, but the truth is that anyone can binge. I have had women and men who have stepped into my office with whom you would never believe binge eat. They are slim, they are active and they are professional in their lives and look completely in-control. Many people have this idea that binge-eating is about the quantity of food consumed in a period of time. Binge-eating has nothing to do with the amount of food you are eating or even WHAT you are eating. It has everything to do with compulsion and being in a stress response. It has to do with the polarities of tension and release and with feeling that food controls you versus the other way around. Yes, so that means you can binge on apple sauce, or carrots or oatmeal just as much as with Doritos, ho-hos or hamburgers. It is simply the feeling that you are not in control of those decisions and that you’ve in some ways dissociated from your body and are on automatic, in full on unconscious eating mode. Once it begins, many people don’t reemerge into their bodies until it’s over. Related Post: Food Shaming: Don't Yuck my Yum! It’s time to completely Unhinge the Binge once and for all! My upcoming 12 week course is a deep-dive in how to do just that. My course encompasses binge-eating cessation techniques but also delves into so much more. I truly believe that this online course (with optional online or in-person group coaching) is a game-changer for anyone who struggles with binge eating, emotional eating or stress eating. And, its also for those who want to improve their relationship with food and bodies or just want to learn more about how mindfulness can help you heal in many poignant ways. I’ve taken my 14 years as a health coach, helping people to become healthier and happier, and transferred this wisdom plus the wisdom and teachings of my Masters program in Psychology, my Certificate in Eating Psychology Coaching and my mindful eating certificate into one digestible and actionable program. and a ton of fun little bonuses too! I am officially launching the course in 2 weeks but I’m offering the course to all of my loyal blog readers at a discounted price for a short time (3 days!) If you are interested in learning how to completely upend your notions about dieting, body image, binge and emotional eating, this comprehensive course is for you. Click on this link to receive your 20% discount right now. Again, you only have 3 days at this price. Enroll today! In the meantime, if you’re not ready to invest in an entire course, how about downloading my FREE 6 part video series on emotional eating right now. Simply click the image below and get immediate access or click right here: I want my FREE video series! Got the Bathing Suit Blues? Do this! Sounds like a great and insightful course!